As part of our mission to focus on the physical well-being of our students, Shorecrest's student health program includes a counselor for all grade levels, health and ethics courses, and a Health Clinic on campus with a full time R.N. available. As the school counselor for the Lower and Middle Schools, Ms. Fierce advocates for the social and emotional development of students. She regularly consults with teachers and parents on issues related to social-emotional development and behavior. Ms. Fierce regularly meets with Lower and Middle School students individually, as needed. She also teaches weekly lessons in kindergarten and biweekly lessons in grades 1-4. These lessons are focused on topics related to social-emotional learning: resiliency, conflict resolution, leadership skills and so on. Additionally, Ms Fierce leads faculty learning opportunities related to the Olweus Bullying Prevention Program, Responsive Classroom and Teaching with Love and Logic. Ms. Fierce received a B.A. in Psychology from Cornell University and a M.S.Ed in Psychological Services from the University of Pennsylvania. She joined the Shorecrest faculty in 2012, after seven years at New Eagle Elementary in Tredyffrin-Easttown School District, a nationally-ranked suburban public school system outside of Philadelphia. As Upper School Counselor, Dr. Pamela Hamilton works closely with students, families, faculty and community professionals to ensure the emotional health and well-being of Shorecrest students. Dr. Hamilton adheres to a preventative, psychoeducational approach and thus emphasizes proactive and developmentally appropriate interventions. She maintains an open door policy for both students and their parents; and addresses issues that range from typical adolescent issues of social conflict, test anxiety, and relationships to the more acute issues of family conflict, mood disorders and chronic health concerns. Dr. Hamilton is also the Upper School Students with Disabilities Coordinator and arranges for appropriate documentation and filing for testing accommodations with the College Board (SAT) and ACT. Having earned a Master of Science Degree in Marriage and Family Therapy and a Doctorate in Counseling Psychology with an emphasis in Adolescent Personality Development, Dr. Hamilton continues to pursue education in the field of neuroscience as it relates to counseling and classroom success. As a member of our outstanding faculty, Dr. Hamilton teaches AP Psychology in upper school as well. For the safety of our community, parents/guardians will be contacted to pick up their child if, in the professional opinion of the nurse, he/she is unable to participate in school activities or may put other students and staff at risk of an illness. A Sports physical is not the same as a Health physical. Even if you visited your doctor before school started, you may still need to have more forms completed before beginning practice with a Shorecrest Athletic Team. Please see the Athletic Forms page for more information. Restrictions related to Physical Education: If your child cannot participate in more than three consecutive physical education classes, a letter must be completed by the child’s doctor and brought to school. If the letter does not include a return to full activity date, then the child will need a release note from the doctor in order for him/her to return to physical education classes. has had a fever of 100.4 or higher for the past 24 hours. For example, if your son or daughter has a temperature of 99 because you have given Tylenol to bring the temperature down, you must start counting the 24 hours after the Tylenol has worn off, 4-6 hours later. We believe this will help to prevent the spread of illness. Be aware that if your child returns to school the next day after being sent home the day before with a fever, we will notify you to pick up your child immediately. is sent home because of vomiting and/or diarrhea. It is important that you wait at least 24 hours after the last episode before returning him/her to school except for isolated cases of vomiting or a single episode of loose stool. has conjunctivitis (red/pink eyes, itching, crusty or purulent discharge to the eye(s). You will be asked to bring your child to his/her pediatrician for diagnosis and treatment. He/she may return to school after receiving a full 24 hours of antibiotic treatment. Students may return to school after receiving a full 24 hours of antibiotic treatment. Students must be treated and be cleared by the school nurse before returning to school. The clinic has the following over the counter medications available to students with the parent’s written consent: acetaminophen, ibuprofen, tums, oral and topical benadryl, hydrocortisone cream, clear eye drops and cough drops. Other medications may be administered at school by the nurse with a written order from a licensed health care provider, with parent written permission. All medications must be in their original prescribed labeled containers. An administration of medication form must be filled out by the parent EVERY school year. Upper School students are allowed to self-carry their inhaler providing that a consent form is filled out and signed by both parent and student. Parents are expected to provide their child’s epi pen (with its original prescription label) to the nurse by the first day of school. An allergy action plan consent form needs to be signed by the parent every school year. Health physical and immunization forms are required each year for every student to start school. Please turn in a new form every year after a physical exam is completed by a pediatrician. With cold and flu season upon us, here are a few reminders to help decrease the spread of germs in our school community. Please teach and review with your children good health habits to protect themselves and others. Just Say NO to Raw Dough! Around the holidays, many of us spend time baking in the kitchen with family and loved ones. 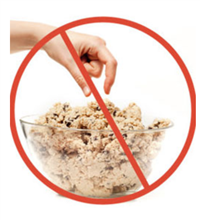 If you are anything like me, I have to constantly tell my kids to keep their hands out of the cookie dough bowl when I am baking cookies! Even I can admit, the temptation to sneak a taste of cookie dough can be quite the challenge! Did you know that the flour we use can contain a harmful bacteria that can cause disease? It has been estimated that somewhere around 400 million households have children living in them that are being exposed to high levels of lead. Exposure to lead can can seriously harm a child’s health, and the negative effects on a child’s health can not be corrected. No safe level of lead in the blood has been identified for children. Because lead exposure often occurs with no obvious symptoms, it can go on unnoticed. Exposure to lead can cause damage to the brain and nervous system, slowed growth and development, behavior and learning issues, and hearing and speech problems. These can contribute to lower IQ, decreased ability to pay attention and under-performance in school. The prospect of college is exciting and scary for both students and parents, but one less worry for parents is to make sure that their college bound students are protected from meningitis. Other required vaccinations for college students include MMR, chicken pox, Hepatitis B and Tdap.